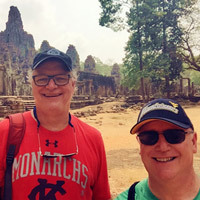 Webster China MBA faculty members Greg Hoffmann and Fred Heismeyer in Cambodia. Two faculty members in the Webster China MBA program utilized the break created by the Chinese New Year to expand their experience in China and deepen their insights into the fast-changing business environment of southeast Asia. Both Greg Hoffmann and Fred Heismeyer have been visiting professors in the China MBA program before and had used those occasions to visit some of China's most sought-after locations. This time around they used the longer break for the spring festival to visit important spots in Cambodia and Vietnam. As always, English-speaking Webster staff in Shanghai, where Webster partners with Shanghai University of Finance and Economics (SUFE), were available to help them find affordable airfare, arrange visas and ideal hotels, and otherwise make it a seamless break during the term. Hoffmann said he's already used new insights from the trip in his courses, particularly the latest in how southeast Asia are competing with one another for manufacturing business. "One of the great things about teaching abroad is the true recognition that we live in a global society in which interdependence is the norm, not the anomaly," Hoffmann said. "Our Webster staff here in China help make these experiences seamless, without a language barrier," said Rich Foristel, director of Webster's China programs. "For visiting faculty, it's important that they are able to take advantage of their time in China to increase their own personal development." Read and see more photos from their experience in this Webster China story.